and an open b-boy/girl cypher to kick off the lecture. 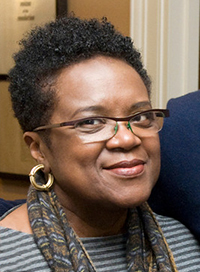 Marcyliena Morgan, Professor of African and African American Studies, is founding executive director of the Hiphop Archive and Research Institute at the W.E.B. Du Bois Institute for Afro-American Research at Harvard University. She has conducted field research on the African Diaspora, as well as on identity and language in the USA, England, and the Caribbean. Her books include Discourse and Power in African American Culture (2002), The Real Hiphop: Battling for Knowledge, Power, and Respect in the Underground (2008), and Speech Communities (2014). Professor Morgan teaches classes on hiphop, the ethnography of communications, representation in the media, language and identity, race, class, and gender. She has received major grants from the Ford Foundation and The Centers for Disease Control and Prevention (CDC). It is nearly impossible to travel the world without seeing the symbols and influences of hiphop music and culture. Many followers of hiphop celebrate its artistic elements of: (1) deejaying and turntabalism; (2) the linguistic style, grammar, and lyricism of rapping and MCing; (3) break dancing and other forms of Hiphop dance; and (4) graffiti art and writing. Yet fans are generally unaware of the political, cultural, and aesthetic aspects of hiphop, especially its complex ideology regarding citizenship, knowledge, truth, language, representation, innovation, and inclusion. 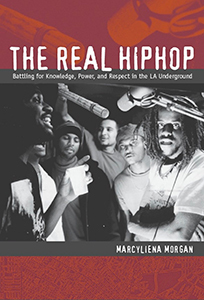 Hiphop ideology is associated with the American Civil Rights and Black Power movements of the 1960s and 1970s and includes an innovative and sometimes provocative perspective on past and present social movements. Consequently, global hiphop mainly conveys progressive American politics of gender, racial, and social class inclusion, transforming both American and global politics in the process. "Did You Mean What You Said?" In his book “The Hard Thing About Hard Things” venture capitalist Ben Horowitz argues that there is no formula for dealing with hard things, but there are patterns and lessons that resonate – and many of them come from Hiphop Culture. This seminar is a discussion and critique of policy, research, comments and attitudes toward speech communities that are dealing with hard things and it identifies ways in which academics can support these communities as they continue to grow.